In the last couple of years, a couple of members of Russia's Shadow Host branched off to do another power/thrash hybrid, Distant Sun. Now that I've gotten a chance to see what they've been up to on their first LP, Dark Matter, it's clear that if one liked some of the great German power-thrash bands of the 80s, one is very likely to enjoy Dark Matter. Distant Sun steers a nicely balanced middle course here between catchy, hook-laden beauty and a rough, serrated thrash edge. Thrash permeates the whole album. Prophet of the Mean has a minor-key, almost Eastern tone to it, but a driving beat and simple, crunching riffing on the lines of Justice-era Metallica. The title track, which is one of my favorites, starts slow, with founding guitarist/vocalist Alexey Markov's voice sounding very similar to Peter "Peavy" Wagner's. His growling vocals, going from a low growl to a higher-pitched melodic yell, are some of the best I've heard out of a modern power metal singer, and the song switches smoothly between the eerie clean picking that used to be obligatory for at least one song on any 80s thrash album, and a more headbangable speed, with a couple of excellent guitar solos interspersed. I loved Godsdoom too, a beast of a song with slamming guitar riffing building up some killer melodic hooks -- lots of Rage influence here, too, but turned up a notch or two in terms of loudness and heaviness. This can go very slightly too far sometimes. Matrix Hacked wasn't one of my favorites, containing so much heavy riffing that the melody (which was simpler than most of the other tracks) was sort of buried. But that's more than made up for by the overwhelming majority of the tracks, and a track like Shattered Empire, with a chorus containing all of the epic melody of a Blind Guardian song (and a good measure of the bombast), is irresistible. After Apocalypto, a mid-tempo thrasher regarding one of Mel Gibson's darkest movies, it's as if the band wanted to get the last bits of thrash out of their system, and Zero to Hero does that with a more vicious-sounding thrash tune at the end of the album. 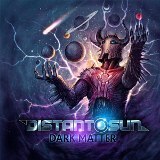 Dark Matter contains a lot of tribute to German power metal, so of course we've heard this sound before, but Distant Sun does it beautifully and with real passion. Power metal fans, grab this one -- you won't regret it.